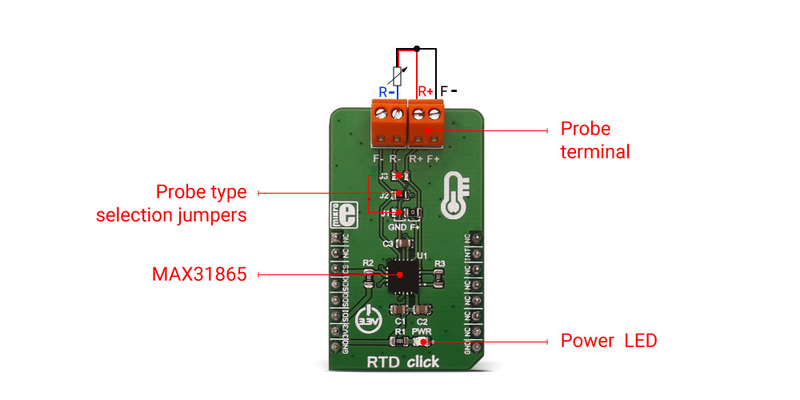 RTD click is based on MAX31865 resistance to digital converter from Maxim Integrated, optimized for platinum resistance temperature detectors, or RTD. The click uses the PT100 type platinum probe for temperature measurement. There are four screw terminals on the board, so different PT100 probe types can be used with this design. This click board™ can work with 2, 3 or 4-wire PT100 probe types. RTD probes are commonly used to measure a range of temperatures between −200°C and 500°C, but the exact value depends on the specific probes used. Features like the 15bit ADC resolution, input terminals overvoltage protection up to ±45V, fault detection, fast response time of 21mS and the SPI interface, make the RTD click an ideal solution when it comes to precise measuring of extremely high and low temperatures. RTD sensors are basically thermosensitive resistors – materials that change the resistance depending on their temperature. In this case, the resistor is a small strip of platinum with a resistance of 100Ωat 0°C - that is why it is called PT100. The RTD measurement is more stable and precise than with most NTC/PTC thermistors, so it is commonly used for measuring temperature in the laboratory and industrial processes. Measurement probe is connected to the RTD click by using the screw terminals, and it has wires that can be 1m long, which makes possible to measure high temperatures from a safe distance. To successfully measure small differences in the sensor resistance, the signal must be amplified. There is an input signal amplifier before the ADC converter, inside the MAX 31865 IC. Once amplified, the signal goes through the ADC converter and then, this value can be then read through the SPI interface on the mikroBUS™ socket. Since the temperature vs resistance curve of the platinum probes is not ideal, a compensating calculation is done with the functions, contained in the click library. The 15bit ADC can provide the resolution of ±0.3125°C, but the total accuracy of the RTD click is ±0.5°C. The 2-wire probe connection can give acceptable results when the RTD is located close to the MAX31865. For the PT100 probes, the series resistance of 0.4Ω causes an error of approximately 1°C. Therefore, as the cable length increases, the error due to cable resistance can become excessive. The 3-wire probe connection is a compromise that uses one less conductor than the 4-wire solution. If the cable resistances are well matched, the error due to cable resistance is canceled. The 4-wire probe connection eliminates errors due to cable resistance by using separate force and sense leads. To select proper mode for the type of the connected probe, the SMD jumpers on the click board must be set to a proper position. The jumper settings can be found in the Onboard settings and indicators table, below. DRDY - Data ready pin is used to signal a ready status to the MCU. This pin will go to a LOW logic state when there is a new conversion result is available in the data register. When a read operation of an RTD resistance data register occurs, DRDY goes to a HIGH logic level. It can be used to trigger an interrupt on the MCU so that the polling of the temperature registers can be avoided. Applications Measuring a wide range of temperatures in hard to reach places and in hazardous conditions.